Fall chinook begin entering the bay in August but won’t move upriver until fall rains bring water levels up. Best fall chinook fishing is in October to early November. Popular choices for bank anglers include large salmon spinners or drifting bait (eggs or sand shrimp) below a bobber. Winter steelhead begin entering the river in late November and fishing for them can be good into March. Both spinners and bobber and jig outfits will work. steelhead is open generally open from Jan. 1-April 30 and Aug. 1-Dec. 31., Chinook salmon from Aug. 1-Dec. 31. This fishery generally allows 2 adult fin clipped salmon and up to 5 jacks per day or 2 hatchery steelhead per day. One single point barbless hooks are required when fishing for salmon or steelhead in the state Oregon. Bait Fish, Roe, and Shrimp. Natural scents usually work the best. Try herring, Sardine, or candle fish or Roe for chinook, shrimp and salmon egg scent for steelhead. Trolling bait, Plunking or drifting sand shrimp or eggs, next twitching jigs and lastly throwing hardware like spinners and spoons. 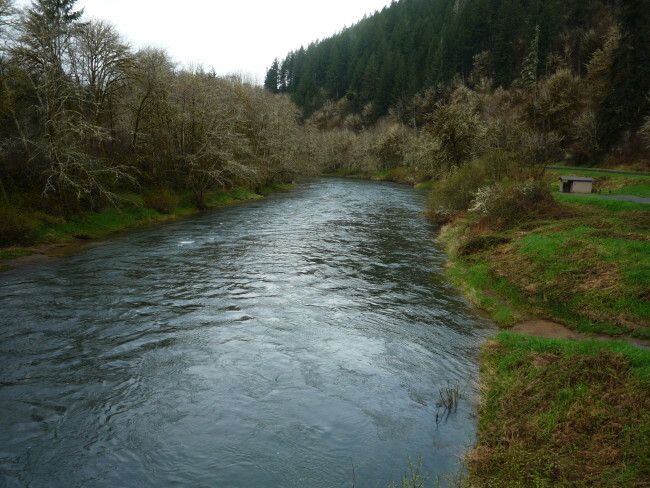 No significant fishing pressure on the Alsea, plenty of open space.